JML Fabrication works with a large customer base of commercial application from the food industry to water technology. 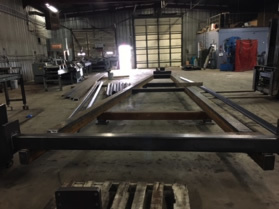 There are such various designs to suit customers needs, and JML is versatile enough to fabricate a application from 1" tube/angle to 20" wide beams. Our welders are certified 6G and up to 1" thick covering just about any scope a project might require. 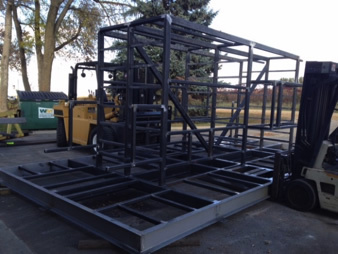 JML Fabrication has fabricated various framing structures from building walkways to airlock facilities. We can build any superstructure from your designs and prints. 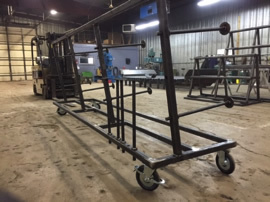 JML Fabrication has been specializing in various size and configuration of equipment framing for specific customers. All frames members had a tolerance of ¼" to be held throughout the frame. 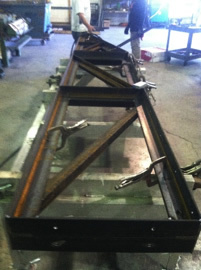 In addition, grinding of surface areas for the frame/equipment to have a cosmetically pleasing appearance when complete. Finish: Galanize, powder coat or paint. Customer came to us with a specific cantilever for their product. We assisted in determining material and design, from there JML fabricated the cantilever to the customers specific needs. Customer came to us because of the tight tolerance needed on this project. JML takes pride on the ability to know our metals and know how they will react with each weld. This project was 35' long and we had to hold a tolerance of 1/16" even after heat treat.